The Venerable Cardinal himself. This portrait is one of the few where his Cardinalatial arms can be glimpsed, on the cover of a book in the foreground. (Source). 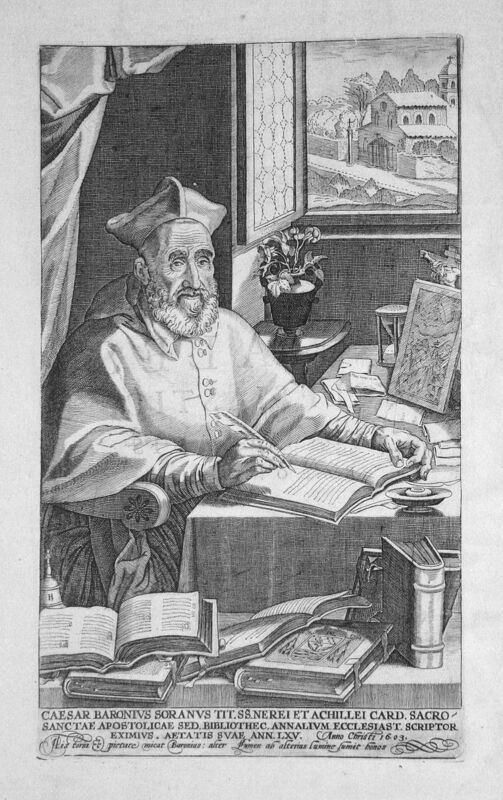 Readers of this blog will learn with no surprise that, having finished Lady Amabel Kerr’s biography of the Venerable Cardinal Baronius, my admiration for this great Oratorian has increased tenfold. As I have concluded the volume, so lovingly edited and reprinted by Mediatrix Press, on the very birthday of the illustrious historian, I thought I might reproduce here two extended passages from Baronius’s correspondence that I found particularly edifying. The first passage is taken from a letter that Baronius wrote to one Justin Calvin. I have thus far been unable to locate much further information about said Calvin, unrelated, I think, to the heresiarch Reformer. Baronius’s Annales and extended correspondence with Justin led to the latter’s eventual conversion. Calvin (or Justus Baronius Calvinus, as he was called once he added Baronius’s name to his own) went on to become a priest and author of, among other works, an Apologia that justified his conversion. God manifestly works in mysterious ways within the long lives of religious orders. He is inordinately fond of strange and unintended coincidences. I return many thanks to the great and most high God, whose tender mercies, as sings David, are over all His works, for having called you out of darkness into His marvellous light. No benefit, no grace can be greater than this, so see that you cherish it carefully and guard it jealously. Do not indulge in paeans of victory; but rather remember that exhortation of the Apostle to walk circumspectly, not as unwise but as wise, redeeming the time because the days are evil…When the devil has been overthrown, he is apt to rise up with renewed vigour, and assault his former conqueror more violently than ever. Our Lord tells us of the wicked spirit who, having gone out of a man, did not rest, but fetched seven other spirits more wicked than himself, and retook by fraud the soul whence he had been driven…Be sure that he will seek you who have escaped him and are now fighting in the ranks of the Church. He may not betray his designs, for he fears lest Saul-converted into Paul by his reconciliation to the Church-should by the first of divine love deal destruction on the lies by which he is wont to overcome men. You, a soldier of Jesus Christ, beware, and lose not hold on the shield of faith which you have taken up. Be master of yourself, overcome yourself, and take heed that you, who were once in the employ of the prince of darkness, be not ashamed of being enrolled under the banner of Christ your Captain…You have, however, no real cause for fear, but only for joy. Rejoice if you are found worthy to suffer anything for the Catholic faith and in defence of the truth. I showed your letter to our Supreme Pastor, who rejoiced to hear the bleating of his one-time lost sheep, who has been found worthy to hear the voice of the Shepherd. He is addressing to you an Apostolic letter, by which he embraces you as if with extended arms, and by his written words places you on his shoulders rejoicing. In him you will always find a true pastor and father. (Kerr 295-96). It behoves me to imitate our Lord and Master Jesus Christ, of whom the Gospel says that He taught as one having authority and not as the scribes, which means that He preached with truth and liberty, whereas they, in their adulation of Herod, yielded to that king’s taste in everything. Far be it from me, I repeat, to write like the scribes, and not declare the truth freely as did Christ. After Him I turn to the holy fathers of the Church, whose example, in writing, it behoves me to follow. In their maintenance of the truth in the face of those who attacked it, they displayed unbending constancy of soul. They did not make use of cringing, diluted, soft expressions, but, on the contrary, employed a language both grand and strong, mingling with it a sharpness of censure which converted their sentences into so many flashes of lightning. If you look through the Annals you will find scarcely a year in which some such example is not cited. By studying the fathers and relating their acts I have by habit adopted their manner of speaking, which should not, in my opinion, be despised, for such speech is bestowed as a gift of the Spirit rather than obtained by human learning. When dealing with heretic or schismatic innovators, or else with princes who corrupt ecclesiastical discipline by their violation of the laws of the Church, or endeavour by their tyranny to reduce her to servitude, I have acquired the habit of writing with the indiscretion which you censure. The words of the prophet, “Cry, cease not, lift up thy voice like a trumpet, and show my people their wicked doings,” keep resounding in my ears as if from heaven. When Eugenius IV was made Pope, St. Bernard exhorted him to nominate Cardinals who should act as John did towards Herod, Moses towards the Egyptians, Phineas towards the fornicators, Elias towards the idolaters, Eliseus towards misers, Peter towards liars, Paul towards blasphemers, and, finally, as our Lord Himself acted towards traffickers in the temple. In other words he urged the Pope to choose men armed with zeal against sinners, who should act everywhere and in every way in such a manner as to sweep away the workers of iniquity. Such is the model drawn for us by the Holy Ghost, and if we do not conform ourselves to it we shall be convicted of deformity. (Kerr 318-20). These are just some of the words which the Venerable Cardinal let slip as so much nectar from his pen and tongue. He was truly one of the greatest scholars that the Church has ever produced, and he revolutionized the discipline of ecclesiastical history. Yet Baronius always saw the Annales as a secondary work to the simple task of salvation. His humility was legendary, and Kerr’s portrait of Baronius captures this peculiar virtue in all its many expressions. It may be said that he never wasted a moment of that rare though precious time when it was permitted him to turn his thoughts directly to God. While driving about in his coach he used to pull down the blinds and give himself over unrestrainedly to the things of the soul, bidding his companion recall him to himself if anything occurred which required his attention. When thus shut into darkness he usually repeated the Holy Name over and over again, or else dwelt lovingly on his favourite interjection, “Eternitas, eternitas,” words which were but the epitome of his ceaseless longing for death and the state beyond the grave. (Kerr 282). Baronius teaches us to use time—that is, our place in history—well. May we follow in his glorious footsteps and one day enjoy with him the eternity he so ardently desired. My friend, Archbishop Mark Haverland, Primate of the Anglican Catholic Church, has just started a new blog called “Anglican Catholic Liturgy and Theology.” You really get what it says on the tin with this one. For those of us with an interest in Anglo-Catholic history, theology, and practice, Archbishop Haverland’s blog will no doubt prove to be a great resource. Those of you following the kerfuffle that has ensued after Spadaro and Figueroa’a article on the alleged political union of American integralists and Evangelicals will no doubt be pleased to know that P. J. Smith has written an excellent introduction to the former over at his blog, Semiduplex. Anyone hoping to achieve a better understanding of integralist theory, and why Spadaro’s assessment is so flawed, would do well to take Smith as his guide. Vera Effigies Augustini Calmet Abbatis Senonensis. (Source). I was recently asked by the administrator of Catholics from the Crypt to write a brief introduction to Dom Augustin Calmet, Abbot-General of the Congregation of St. Vanne. My qualifications for this task are minimal but, I think, sufficient. First, I know a little about Calmet, which is, sadly, more than many can say. He is an unfairly overlooked figure in our religious and cultural landscape. Secondly, I hope to write my Master’s Thesis on Calmet’s Histoire Universelle, though of course the actual process of research might change my direction. For the time being, I am glad of the challenge, and will likely turn this into the first of a series of short biographies of weird religious figures. Dom Calmet, born on the 26th of February, 1672, in the then-Duchy of Bar (now Lorraine, France) had a long and impressive career. Entering religious life at the Benedictine Priory of Breuil, he moved around over the years to obtain his education at various abbeys. His itinerary reads like an honor roll of some of the finest establishments of the Franco-German monastic intelligentsia: St. Mansuy, St. Èvre, Munster, Mouyenmoutier, Lay-Saint-Christophe, St. Leopold. Yet the two monasteries most closely associated with his career are Senones Saint-Pierre and Vosges, where he eventually died a holy death. He achieved widespread scholarly respect for his work in three different fields. First, Calmet distinguished himself as an Exegete. His Biblical method differed from more classical forms of exegesis by focusing entirely on the literal meaning of the text; this exposed him to criticism, even amidst the general acclaim which the book and its abridgements garnered. Title page of Book I of his most famous work on Vampires. (Source). Second, he became an eminent author of sacred and profane history. While my own interest lies most heavily with his Histoire Universelle (1735-47), Calmet also devoted considerable attention to more specific topics. It should come as no surprise, given the libraries to which he had access, that he devoted special care to the region which bore him. His titles include History of the Famous Men of Lorraine (1750), Dissertation on the Highways of Lorraine (1727), Genealogical History of the House of Châtelet (1741), and posthumous histories of both Senones (1877-81) and Munster (1882). However, Calmet achieved lasting fame for his extremely popular work on Vampires: first, Dissertations on the Apparitions of Angels, Demons, and Spirits, and on the Revenants and Vampires of Hungary, Bohemia, Moravia, and Silesia (1746) He later expanded the text into his famous Treatise on the Apparitions of Spirits and on the Vampires or Revenants of Hungary, of Moravia, &c. in 1752. These texts were, to the best of my knowledge, the first attempt to apply scientific rigor to the tales of the undead then current throughout Europe. Re-released in 1748, with the most complete edition in 1751, this book is considered to be [the] authoritative treatment on the subject, containing an unprecedented collection of ghostly stories of revenants. It was a best seller for the period, quickly translated into German and Italian for a broader audience. Calmet’s tone considers the possibility of vampires with a certain ambiguity, possibly in light of the larger body of his publications for the church. Still, this is widely regarded as the starting point of all vampiric literature. What! It is in our 18th century that there have been vampires! It is after the reign of Locke, of Shaftesbury, of Trenchard, of Collins; it is under the reign of d’Alembert, of Diderot, of Saint-Lambert, of Duclos that one has believed in vampires, and that the Reverend Priest Dom Augustin Calmet, priest, Benedictine of the Congregation of Saint-Vannes and Saint-Hydulphe, abbot of Senones, an abbey of a hundred thousand livres of rent, neighbor of two other abbeys of the same revenue, has printed and re-printed the History of Vampires, with the approbation of the Sorbonne, signed by Marcilli! We can only imagine what conversation transpired between the two thinkers when Voltaire stayed at Senones in 1754, only a few years before the abbot’s death. My goal is not at all to foment superstition, nor to maintain the vain curiosity of Visionaries, and of those who believe without examination all that one tells them, as soon as they find therein the marvelous and the supernatural. I do not write but for those reasonable and unprejudiced spirits, who examine things seriously and with sang-froid; I do not speak but for those who do not give their consent to known truths but with maturity, who know to doubt things uncertain, to suspend their judgment in things doubtful, and to refute that which is manifestly false. (Calmet ii). Perhaps we should not be so surprised. After all, the religious history of Europe is peppered with eccentric and erudite men drawn to esoteric studies. And by the time that Dom Calmet died in 1757, the French monastics had not yet reached the height of their oddity. That would come later, with the well-traveled and thoroughly bizarre Swedenborgian and Martinist monk Antoine-Joseph Pernety, whom I hope to someday investigate more thoroughly. The Revolution changed all that. No longer could monks live their lives freely, let alone attempt serious academic inquiry. It would take the genius of men like Dom Prosper Guéranger to restore the French Benedictines to their former glory. Senones Abbey today. The monastery was dissolved by Revolutionary forces in 1793, then later sold off as State Property and converted into a textile mill. This desecration continued until 1993, when what was left of the abbey became a Monument historique. (Source). I came across this passage in Lady Amabel Kerr’s biography of Cardinal Baronius, as republished by Mediatrix Press in 2015. It comes a letter sent by the Abbot of St. Martin’s to Baronius when the latter was “in a fit of despondency…as to the real value of the Annals” (Kerr 154). I felt it was a good bit of advice generally, and thought I’d make it more readily available here for those who might derive some benefit therefrom. The translation is, no doubt, from Lady Kerr’s own hand. It can be found on page 154 of the volume. Do not be cast down. Eat the bread of life and drink of eternal wisdom; and so will you more easily reach the Mount of God. You have not got to live for yourself alone, but for the Church of God and the good of your fellow men. Acquit yourself manfully, and your heart will be comforted, and God will sustain you. Truly it belongs to our mortality to be filled with fear when we look forward to the day of our judgment; but perceiving as we do so many earnests of our eternal happiness, and experiencing as we do the work of the Spirit of God within us, why should we be anxious and tormented of soul? Be of good heart, my Cesare, and think of nothing but of persevering until you have completed your work, which is so pleasing to the Church, and which will live for ever. When it is finished, then by all means devote yourself solely to the thoughts of eternal life; and I feel confident that at the last day the just Judge will give to you, who have worn yourself out by your labours for Him, a crown of justice.